If you’re a seafood lover, I’m sure you would enjoy this authentic dish! To make it clear right away: arrow squid is not the same thing as squid, they are “relatives” and belong to the same category, but arrow squid has more intense pink color, is smaller and more resistant than normal squid and has flippers only on the lower part of the body. There is a wide offer of arrow squids on fish market and they are significantly cheaper than normal squid. I always try to find the smaller ones, about 2-3cm long because they are softer and their flavour is more delicate than of the bigger ones. And as the old proverb says: Fish swims three times – first time in the sea, second in olive oil and third in wine… in this case it swims 2 times in wine which is even better! This delicious meal is quite aromatic and more important: incredibly simple to prepare. 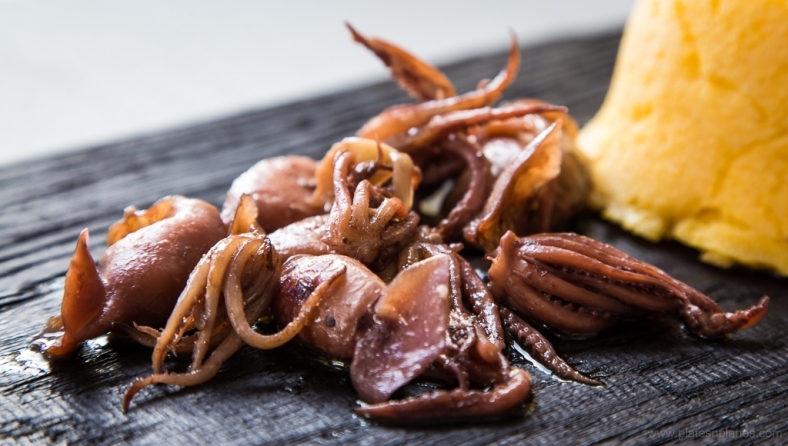 Once arrow squids are cooked in red wine, the rich flavor is guaranteed. This tangy seafood creation goes wonderfully with polenta, cooked potatoes, rice or pasta – pick your favorite among those! Or, if wanting a lighter meal, with iceberg letuce salad that also goes very well with it. 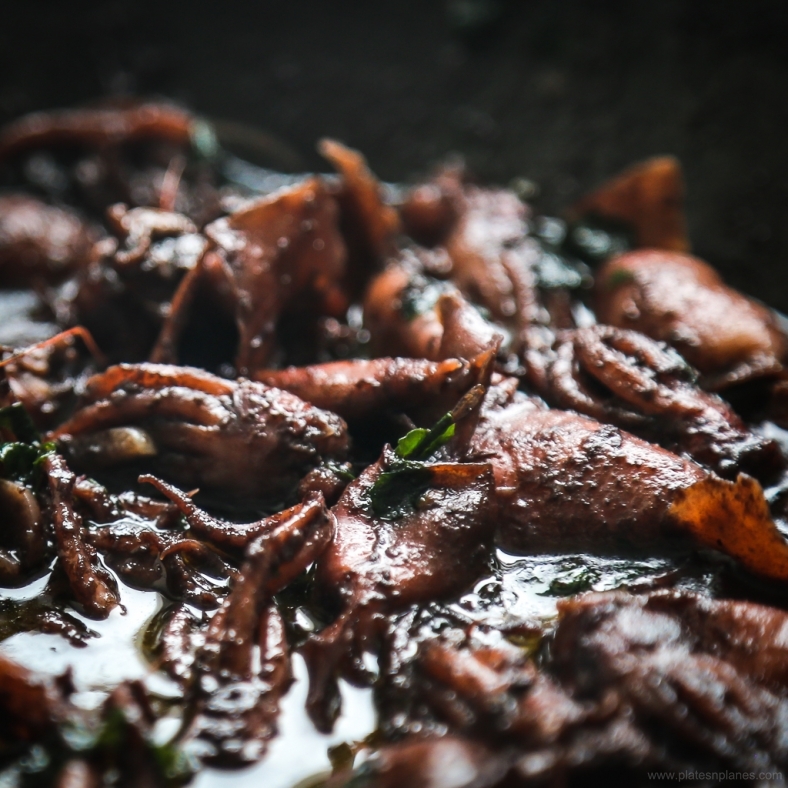 I usually serve it with polenta which subtle taste balances out the strong and intensive taste of arrow squids cooked in red wine. 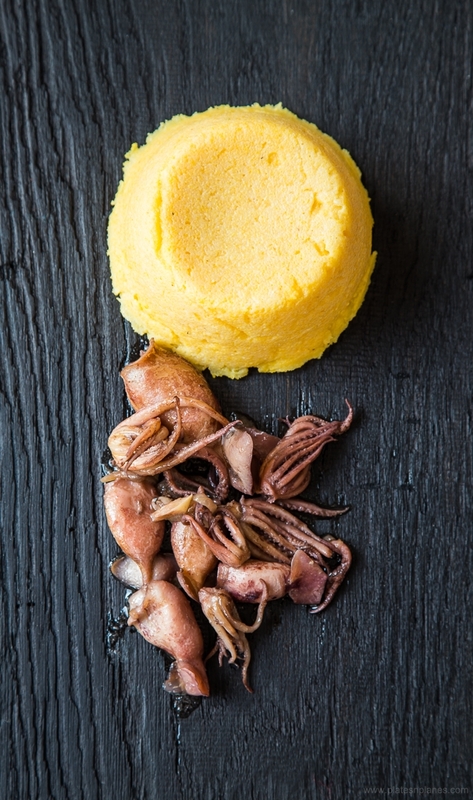 Last but not least, yellow color of polenta looks very attractive together with arrow squids’ dark sauce. 1. Take the head out of the body, take the innards out, wash well. Head – separate the part around the eyes and throw it away, save the tentacles. 5. Pour the wine over it, raise the temperature and cook for a few minutes until half of the wine evaporates. 6. Turn the stove off and add freshly chopped parsley. Best to be served straight after prepared with a glass of red wine.